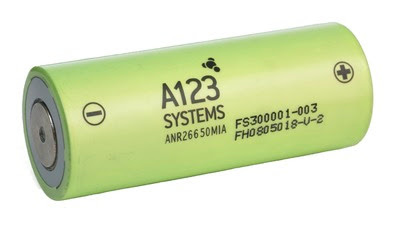 This is the type of battery I have been using in my hybrid electric bike since 2006. Each battery is good for 0.23 amp hours. I string forty together in a series/parallel configuration for a total of 4.6 amp hours. 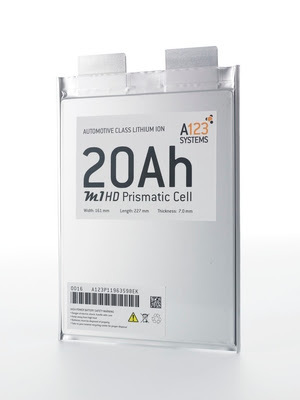 Above is a picture of their new automotive class 20 amp hour battery. I know first hand how well these batteries perform and it is nothing short of amazing. I'm still using the same ones and they still work like new (see here, and here). Pacific Ethanol soared to $42 per share in May 2006 and now are worth about 57 cents. VeraSun, an ethanol maker thought to have huge potential a few years ago, is now bankrupt. However, nothing is for sure. They may have a killer technology, but that does not mean somebody won't come along with an even better battery. One misstep like a giant battery recall due to a manufacturing flaw could end it all. There may be health concerns about the nano particles used, patent infringement claims, or even lithium shortages. It's a complicated world. Our government seems to think they have potential, having just awarded them a $250 million DOE grant. But that same government still backs corn ethanol so maybe this is a bad sign. I called this shot way back in 2006. As I always say, the secret is to call lots of shots, highlighting only the ones that pan out.